Ever since they were first invented back in the day, it was instantly apparent that building a good ukulele takes a lot of finesse. From that period until today, this instrument has seen spikes and drops in popularity. Right at this moment, we are in a middle of a pretty large spike. 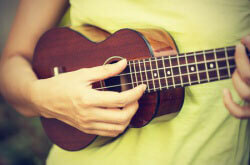 The reason why this rather trivial piece of information is important has a lot to do with the uke market. 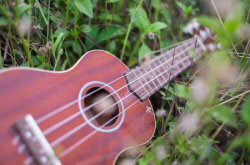 Newly found interest in ukulele prompted several new brands to appear and try to establish a foothold in the market. One such brand is Kala. A story of a new musical instrument brand usually tends to go one of two ways. They either saturate a certain portion of the market, usually the cheapest segment, with mediocre models or they do what Kala does. Since they first appeared a decade or so ago, Kala made it their business to offer superior quality at competitive prices. 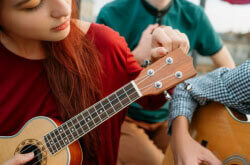 This policy is partially why they are among the most popular ukulele brands at the moment. Today we are going to take a look at one of their entry level models, which has shown to be a true contender. It goes by the name of Kala KA-15S and is a great choice for beginners and intermediate players alike. Why Kala and Why KA-15S? The route Kala has taken in order to make their presence known in the market has benefited the users immensely. The objective was to try and deliver a superior alternative to the best model in the target category. If it sounds much easier said than done, that’s because it is true. However, they had one thing on their side, and that was the staff. Based in San Francisco, Kala managed to gather a great group of luthiers, designers, and engineers whose joint efforts allowed them to succeed. These days Kala is doing more than great. Not only have they established that foothold, but they turned it into a pretty solid reputation. In other words, they reached a stage where they could start charging for the brand itself. There were some pretty reasonable fears of them dropping the quality for optimal profit. They definitely wouldn’t be the first ones to do something like that, that’s for sure. However, Kala pushed through this test of integrity, maintaining their standards of quality across the range. Keeping such policy made their entry level models a hot commodity. After all, everyone likes a good bang for the buck instrument. At the moment, Kala KA-15S is among the most popular ukuleles in the affordable range. Now that we have set the stage for the review to come, let’s get started with the overview of the instrument at hand. Kala KA-15S belongs to the soprano category of ukuleles. In other words, it is the most popular size out there, and for a good reason. Sopranos are generally the type ukes that produce the tone most people associate with this instrument. The wood they have chosen for this build is mahogany. Both the body and the neck are made of this tonewood. Now, mahogany is definitely not the optimal solution for ukuleles. That’s the first thing you will learn from the conservative side of the isle. By their standards, if it’s not made of koa, it is not a true ukulele. With that said, mahogany does a great way to substitute this relatively rare and more expensive wood. 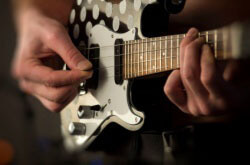 It is hard enough, light and overall a good choice for musical instruments in general. The neck features 12 frets on a 13.625-inch long scale. You get a rosewood fretboard with standard inlays on the 5th, 7th, and 10th fret. With all that said, this ukulele is just a treat to look at. Speaking of looks, KA-15S comes with a very nice satin finish that gives the instrument a much more refined look. In terms of details, you get a simple but attractive rosette. In all honesty, that is about all you can expect in this price range. Does the lack of details affect the aesthetic appearance of KA-15S? That is up for debate. I personally like the low profile look, but there will be those who crave visual details to a point where their presence becomes a factor. The overall build quality is what defines this affordable ukulele. Kala’s manufacturing process is a bit different from your average uke brand. Sure, they are still mass producing these instruments, but the quality control is on a level of its own. If you take a closer look at the way different elements were put together, or how the neck is joined to the body, you just won’t find any sloppy work. They are running a tight ship over there in Kala, which is a description that easily applies to their instruments as well. The only real issue you may run into is the factory setup of this uke. Sometimes it arrives perfect, other times it will need some adjustment. However, this is not that huge of an issue especially if you consider the price range. On top of that, it is always recommended to take the instrument to a shop for a proper setup anyway. When it comes to hardware, Kala stuck to the basics. ’If it ain’t broken, don’t fix it’ is a saying that holds true to this day. Instead of going for any of the cheaper alternatives out there, they have chosen to go with the standard rosewood bridge and fretboard. The bridge hosts aa saddle, while the nut is also made of this material. For those of you who are not familiar with GraphTech, they are the brand that makes most of the Tusq components used in a variety of stringed acoustic instruments today. Tuners come in form of more or less standard machines. While they are not something you would consider to be best, their performance is well within the limits of acceptable. As a matter of fact, Kala’s default tuning machines are better than what most other uke brands offer in this price range. Last but not least we have the strings. Kala KA-15S arrives with a set of Aquila Super Nylgut strings. These are a perfect choice and sit extremely well on this soprano. You won’t need to change them anytime soon, that is for sure. In terms of sound, the situation is even better. Is it the best sounding ukulele on the market? Far from it, but what it does offer is balance across the range. There are no spikes in trebles or muddy lows. This thing is as flat as they come. Combined with the fact that it still retains that signature soprano tone, we are looking at one very capable entry level ukulele. You might notice it lacking a bit of sustain, or that there’s no abundance of richness in its sound. If we were talking about a much more expensive ukulele, these things would probably be a big issue. As it is, Kala KA-15S managed to meet and exceed all reasonable expectations. 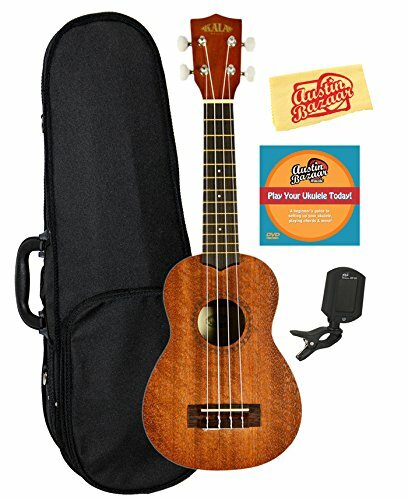 This ukulele will keep up with you from the moment you learn your first chords all the way to a point where you can declare yourself an intermediate player. Experimenting with different strings almost guarantees an improvement in tone color and other aspects of sound. This is not something you absolutely have to do, but it’s one of the several upgrade paths on the table. Just like it is the case with the majority of entry level ukuleles, KA-15S consists of series of compromises. Some of its features are better than other, but one thing stands. The way Kala balanced this instrument puts it at the very top of its price range. Let’s do a quick rundown of some things we like and some we don’t, so you can form a clear picture about this uke. It’s absolutely clear that pros outweigh the cons by a significant margin. If you are just starting out, there is really no reason not to go with this Kala soprano. Kala’s path from an unknown brand to the top has been a rocky and interesting one. Nonetheless, they have managed to reach a level of popularity that will allow them to expand their influence on the market. Their decision to keep up the quality they initially offered has been praised by the community numerous times. Kala KA-15S is a great example of why this is important. By offering such a great value in the entry level range, Kala has proven that they really care about their customers and the community as a whole. Who is this uke best for? Beginners will benefit immensely from the KA-15S. However, even those with a bit more experience will find this model to be a great bang for the buck. It might not be something you would want to bring with you on stage, but it’s more than capable of holding its ground against more expensive ukuleles out there.